La Fura dels Baus will premiere next 6th of December the opera Oedipe at the Dutch National Opera in Amsterdam. It premiered at La Monnaie in Brussels (2011), the Teatro Colón in Buenos Aires (2012) and the Royal Opera House in Londres (2016). And now the opera will be performed for the first time in Holland: 7 shows until the 25th of December. 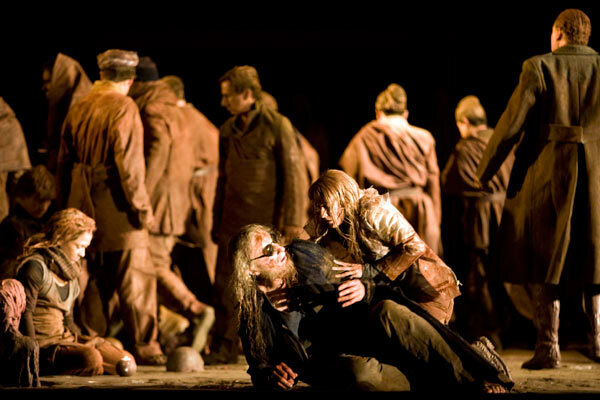 Oedipe directed by the furan Àlex Ollé is a reinterpretation of the classical myth of Oedipus based on the work of the composer George Enescu. Ollé’s vision has two main themes: ‘clay’ to illustrate the destination, and ‘time’. The two elements that are staged are: the mud that permeates everything-all the characters are covered with mud, all the elements that go out, space itself; and the idea of ​​mythical time and historical time. Thus, the metaphors follow the main character who travels through time to this day, starting at a consultation with the psychoanalyst Freud -to talk about the Oedipus complex- until World War II. He does this through a journey that is not chronological in time, but serves to illustrate the validity of the myth in various historical moments. The Furan version of Oedipe at the Royal Opera House will feature performances by Johan Reunter, John Tomlinson, Sarah Connolly and Sophie Bevan, among its cast. The duration of the show is 3 hours (with intermission), and will be sung in French, with English supertitles. For more information and tickets you can check the official website of the Dutch National Opera.